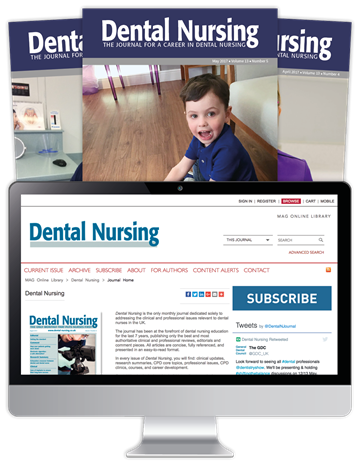 Dental Nursing is the monthly journal for dental nurses, addressing the clinical and professional issues that matter to you and supporting your educational development. Every issue of Dental Nursing is filled with high quality, relevant articles selected by a distinguished editorial board, ensuring you are kept up-to-date with the latest developments taking place in clinical practice. The journal covers core clinical subjects such as cross-infection control and medical emergencies as well as more advanced topics including oxygen administration, radiography and orthodontics.